Cambodia is a country rich in natural resources that sustain the wellbeing of the nation's population and contribute to the country's economy. It has the largest areas of contiguous and intact forests in mainland Southeast Asia. Millions of people in Cambodia, many rural and poor, depend directly on the natural environment for their daily basic food, water, energy needs and income generation. All Cambodians depend on the country's forests to: regulate the water and soil cycles; provide protection against floods; storm protection; recreational benefits and tourism revenues. All of these benefits are known as ecosystem services which are the goods and services nature provides us for free and are essential for life support processes (Millennium Ecosystem Assessment 2005). These services however are threatened by continued deforestation driven by large-scale infrastructure projects, timber production, illegal logging, mining projects, and other development activities. Economic growth is essential for the country to develop. However, economic growth at the expense of natural resources and ecosystem services is unsustainable, weakening the functioning of the country's ecosystems and increasing vulnerability among the poorest communities. WWF Cambodia therefore recommends an ecosystem approach to land use planning to ensure that development projects take place outside of areas of critical ecological importance thus preventing economic activities from undermining the functioning of ecosystems.With the generous support of the European Union and USAID and in collaboration with the Royal University of Phnom Penh, WWF Cambodia has conducted a study in the densely forested province of Mondulkiri to highlight the location and value of the province's key ecosystem services with a view to integrate ecosystem services into land use and spatial planning decisions. The Royal Government of Cambodia's (RGC) National Spatial Planning Policy aims to address land use challenges and ensure that land and natural resources are used and managed in a sustainable, effective and equitable manner to support socio-economic development, food security, national defense and natural balance (RGC 2011). Without effective land management planning and integrated land use plans, it is likely that: encroachment into Protected Areas (PAs); unsustainable exploitation of forests and fisheries; and poor water management, will become exacerbated. The poorest are likely to be most severely affected (Diepart 2008) however, Cambodia's economy too is also likely to be impacted as the country depends on natural resources for economic development and tourism. As recognized in the National Strategic Development Plan (NSDP) 2014-18 (RGC 2013a), there is a need to better manage Protected Areas and a need for more information on biodiversity and natural resources. The RGC has demonstrated its willingness and commitment to work towards sustainable development, as evidenced in the National Policy and Strategic Plan on Green Growth (2013b), the National Green Growth Roadmap (2013c) and the current efforts to develop an Environmental Code (in development, 2016). Ecosystem-based management and planning can contribute to achieving sustainable development, defined as development that meets the needs of the present without compromising the ability of future generations to meet their own needs (WCED, 1987; Cohn and Lerner 2003). Provide insights on how priority ecosystem services could be affected by different interventions (policies / actions) in the future, by producing maps of these ecosystem services in 2030 according to different future scenarios. The team produced maps, in pixels and by sub-watershed, of the following ecosystem services: carbon storage; non-timber forest products (NTFPs); habitat quality of wildlife; annual water yield; avoided nutrient pollution (or nutrient retention); and avoided sediment pollution (or sediment retention). The following ecosystem services were also assigned an economic value: carbon storage, NTFPs and annual water yield. The remaining ecosystem services were either too small to be valued (as in the case of sediment and nutrient retention) or required primary valuation studies that were not available (as in the case of habitat quality). The baseline maps produced to quantify and identify the location of hotspots of ecosystem services used 2010 data on forest cover published by the Forestry Administration, Department of the Ministry of Agriculture, Forestry and Fisheries (MAFF 2011) in order to use the most recent official, Land Use Land Cover maps as a data source. 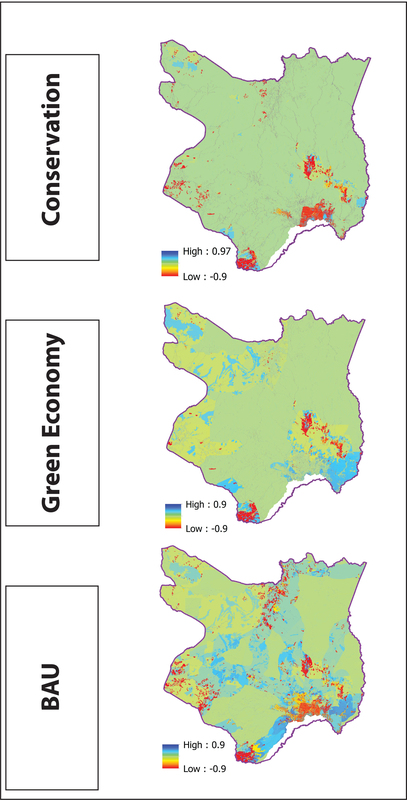 In addition to the mapping and valuing of ecosystem services to produce the baseline maps, ecosystem services were mapped under different future scenarios which showed the changes in Mondulkiri’s ecosystem services (in biophysical and economic terms) in 2030 under a: Conservation (or low deforestation) scenario, Green Economy (or moderate deforestation) scenario and Business as Usual (high deforestation) scenario. 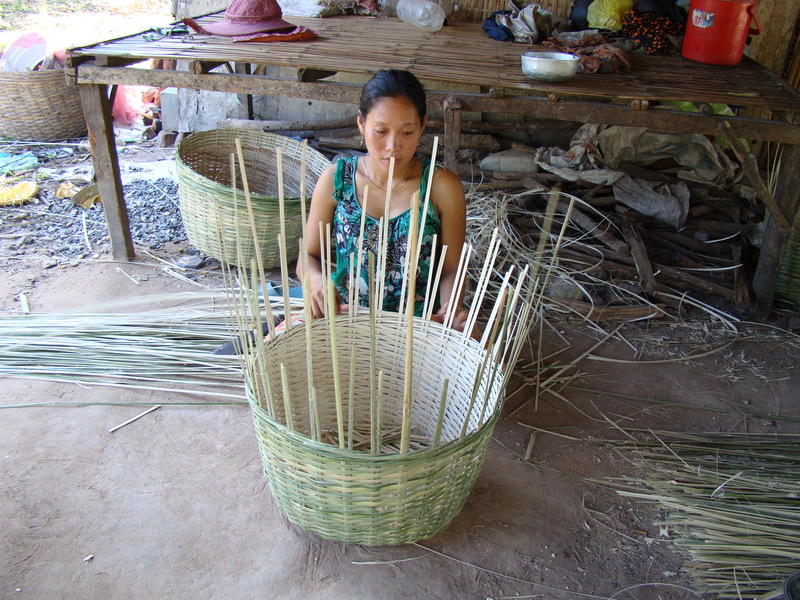 Supporting the birth and growth of NTFP enterprises is a way of supporting local economy. This support can also help to reduce the incentives for illegal deforestation for livelihood purposes among local populations.